Blackburn Rovers held Derby County to a goalless draw at Pride Park. Derby had the best first-half chances as Florian Jozefzoon headed over and saw an acrobatic effort blocked, while Rovers keeper David Raya denied Jayden Bogle. The Rams started the second half in the same fashion and Mason Mount's free-kick struck the crossbar, before Bradley Dack hit the side netting for Rovers. Mount, who was being watched by England manager Gareth Southgate, fired just wide in the closing stages. Derby, who had previously won three matches in succession, are now without a win in the past two games, with this home draw coming on the back of last Saturday's defeat at Rotherham. The hosts created far the better chances throughout the game, but the visitors stifled them and secured a hard-fought away point. Frank Lampard's side were always on top and created four good chances in a five-minute spell in the first half. Mount had a 20-yard shot deflected wide and was denied from close range, while Richard Keogh saw his fierce drive blocked and Jozefzoon's overhead kick deserved better. Blackburn stood firm under all the pressure and will be left frustrated that Dack fired into the side netting with the goal at his mercy, while Scott Carson saved Adam Armstrong's daisy-cutter. "The performance was very good and the first half was spectacular, because it should be three goals and then it would be spectacular. "We hit the post, had balls blocked on the line and the keeper was saving everything. "Our creativity on the ball, the way we created chances and the way we worked hard to win the ball back was what I am asking for." "I am happy to take a point but I think it was an eye-opener for us in terms of the quality of the top teams in this league. "We tried to do what we do but yet they were good enough to play round that. "Some teams we have played against this year tended to go over the top. Derby continued to play through us first half, but I think second half we managed it better." Match ends, Derby County 0, Blackburn Rovers 0. Second Half ends, Derby County 0, Blackburn Rovers 0. Foul by Jayden Bogle (Derby County). Harry Wilson (Derby County) wins a free kick on the left wing. Harry Wilson (Derby County) wins a free kick in the defensive half. Martyn Waghorn (Derby County) is shown the yellow card for a bad foul. Foul by Martyn Waghorn (Derby County). Richard Smallwood (Blackburn Rovers) wins a free kick in the attacking half. Martyn Waghorn (Derby County) wins a free kick on the right wing. Attempt missed. Elliott Bennett (Blackburn Rovers) right footed shot from outside the box is close, but misses to the left. Assisted by Danny Graham with a headed pass. Attempt missed. 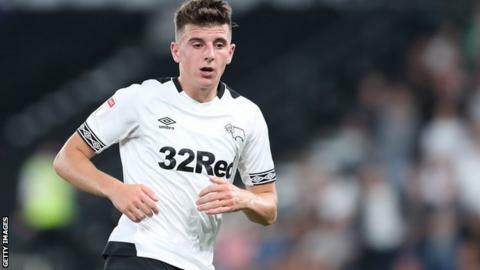 Mason Mount (Derby County) left footed shot from the left side of the box misses to the right. Assisted by Jack Marriott. Corner, Blackburn Rovers. Conceded by Fikayo Tomori. Ryan Nyambe (Blackburn Rovers) wins a free kick on the right wing. Attempt blocked. Bradley Dack (Blackburn Rovers) right footed shot from outside the box is blocked. Assisted by Amari'i Bell. Substitution, Derby County. Jack Marriott replaces David Nugent. Amari'i Bell (Blackburn Rovers) wins a free kick on the left wing. Substitution, Derby County. Martyn Waghorn replaces Mason Bennett. Jayden Bogle (Derby County) is shown the yellow card for a bad foul. Attempt missed. Bradley Johnson (Derby County) left footed shot from outside the box misses to the left. Attempt saved. Danny Graham (Blackburn Rovers) right footed shot from outside the box is saved in the bottom right corner. Substitution, Derby County. Harry Wilson replaces Florian Jozefzoon. Darragh Lenihan (Blackburn Rovers) wins a free kick in the defensive half.